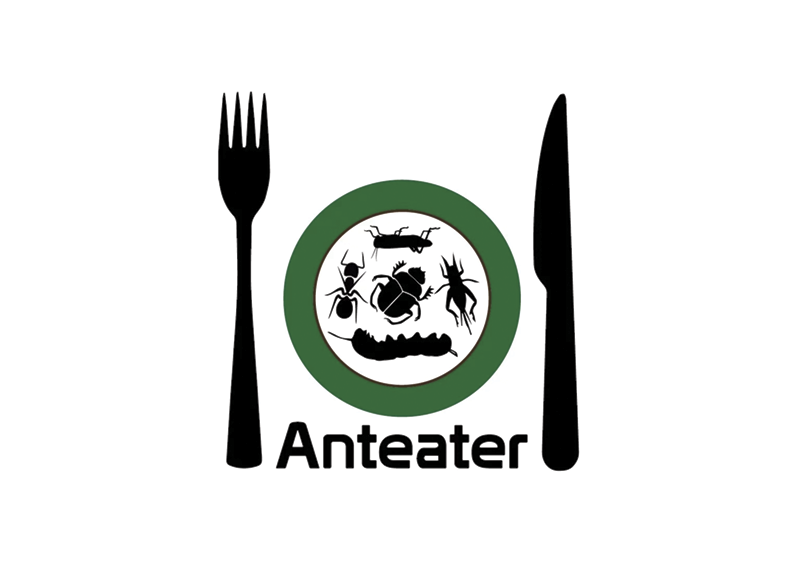 Anteater is a Christchurch-based startup that offers locally grown skyprawns (locusts), lemongrass ants, and huhu grubs for sale, alongside imported Canadian cricket powder. Yes, edible insects are a thing, an increasingly big thing. According to Global Market Insights the market for edible insects is set to grow to over half a billion US dollars by 2023. And clean, green NZ could become a premium supplier of edible insect products, if Anteater have any say in the matter. In a world where livestock contribution to CO2 emissions and global warming is a serious issue, it makes sense to look at other sources of sustainable food. Farming insects can produce up to an order of magnitude more protein per unit land area, with a much lower environmental impact than farming cattle or sheep. Anteater’s mission is to “accelerate the advent of sustainable agriculture”. Insects are all the rage in high-end restaurants. Regular customers include Roots, Vault 21, Antoine’s, Pescatore, and Kazuya as well as the nationwide Mexico chain. The ants are used as a garnish, and provide an intense burst of flavour. In a strange reversal, New Zealand ants taste like lemongrass, and Thai ants taste like Marmite. Locusts are similar in texture and flavour to freshwater prawns, hence the moniker “skyprawns”. Cofounders Peter Randrup and Rebecca De Prospo met at Startup Weekend Christchurch in April this year, where they worked on a startup to farm insects. They didn’t win any prizes, but they did validate the basic business concept. True to lean form, they pivoted on the Monday after the weekend to becoming a niche wholesaler rather than farmers, as they saw that this is where the value is. Peter says that their initial pitch to Giulio Sturla, the owner and head chef at Roots Restaurant, was for cricket powder. Giulio wasn’t interested, but asked if they could source some local ants. Giulio asked, “I need 100g of ants by Tuesday – can you do it?” Peter thought “Oh sh!t”, but answered “Of course we can”, not realising just how many ants that is – around 300,000. He spent the next four days figuring out how to separate ants from dirt, but got there in the end. That’s the startup spirit! Giulio is now a regular customer. Anteater were recently Grand Winner in Canterbury University’s Entre 85k Challenge, scooping up $22,000 worth of prizes. As this post is published, Peter and Bex are in Thailand doing research into how commercial insect farming operations work there, and researching possibilities for trading insects between New Zealand and Asia. They hope to have a retail-ready meat substitute product on the market in the near future. Peter explains: “If you swap out one meal of conventional protein for insect protein per week, you’d be freeing up 100-150m2 of land. Every year you’d save your body weight in CO2 emissions, and tonnes of “blue water” – fresh water fed to meat animals. What’s not to love? Give the product a go at any of the restaurants listed above, and keep your feelers out for insect-based meat substitute at a fine food retailer near you. Peter and Bex will be presenting at Ministry of Awesome’s Coffee and Jam in Christchurch at EPIC on Tuesday 8 November at 12:30pm. And if you’re keen to meet amazing people like Peter and Bex, bowl up to a Startup Weekend. Startup Weekend Auckland takes place 18-20 November at Massey University in Albany, and Startup Weekend Environment takes place 25-27 November at Massey University in Wellington. More Startup Weekends are also planned next year around the country. De-risk events using a “lean” approach to ticketing. Run your startup like a science experiment – document your assumptions, validate whether or not they’re true, alter your business parameters (pivot) to incorporate your learnings, repeat until you either achieve product-market fit or run out of resources. It turns out that startups aren’t the only thing that Lean can be applied to. SuchCrowd provides a lean approach to event planning. Not sure whether there’s a market for melodic death metal in Arrowtown? Before you go and book Lamb of God into the Arrowtown Athenaeum Hall and set up a gig you’re not sure will break even, you can use SuchCrowd to validate your market. The SuchCrowd team calls it Lean Events Theory. SuchCrowd lets you set up a tentative event, and start selling tickets. If you don’t get to the minimum number of tickets sold by a preset deadline, all of the existing ticketholders get a full refund. Once the event reaches the minimum number of tickets, the event is formally scheduled. The platform provides tools to help people passionate about the event share info about the event increasing the chances of getting to critical mass, and building the artists’ fan base. It’s worked really well for events like the Popup Kitten Cafe and Startup Weekend Dunedin 2016. In the case of Popup Kitten Café, they reached their minimum number of tickets in only 40 minutes. And Startup Weekend Dunedin 2016 reached critical mass three weeks before the event – that’s two weeks ahead of the predecessor 2015 event. Clearly, it’s working. You can even A/B test parameters around events like venue, time, ticket price, and so on. Get early engagement before pouring money down the drain marketing a product that the market doesn’t want. Lean. Next on the product line up – SuchCrowd is building a promotion engine which helps anyone with any level of tech savviness to promote their events on social networks and media easily and effectively so that event planners can get quick feedback on whether their event will fly. SuchCrowd has now run 45 events between Dunedin, Christchurch, and Wellington, with one event also one in the US. They’ll be launching their Aussie platform before the end of August, mainly at the request of Australian bands who have toured NZ and loved the service. I first met the cofounders Abbe Hyde, Jake Manning, and Tin Htoo Aung at Startup Weekend Dunedin 2015, where they were working on a company to handle online marking of university assignments. During the course of the weekend, they found that it was a busy market and not all that attractive, but the team stuck together and decided to do a “real” startup doing something else. Tin is from Myanmar (formerly Burma), where he was the CEO of a software development company that had built a ticketing system for the challenging Burmese market – challenging because they just didn’t have the infrastructure at the time (reliable Internet, payment gateways, etc) that we take for granted in New Zealand. When they started investigating the ticketing market, they discovered the number one problem shared by people running events was fear of not being able to sell enough tickets to break even. This is especially true of people running events with emerging talent. SuchCrowd was developed to solve this problem that remained unaddressed by any of the existing ticketing platforms. These guys are lean machines. They currently in a sprint where they have a target of testing 10 hypotheses per day. This is a practice they picked up in Lightning Lab Christchurch, which they attended last year. They really loved the Lab, and strive to recreate accelerator culture in their company every day. Since the end of the Lab the team has tripled in size – they’re up to nine people, whose roles outside of work include being a comedian, two dancers, bass guitarist, and an actor. They’ve just completed a raise of $150K using the Simmonds Stewart Kiwi KISS documentation that’s been hacked to meet SCIF requirements. That’s a real milestone – the first new investment type to be accepted by SCIF in over a decade. This funding will carry them through to the end of the first quarter 2017, when they’ll be raising a seed round. If you’re running an event of any kind, and you’re not sure how many people you might be able to get to come, by all means check out SuchCrowd, and if you’re interested in following the antics of this creative team, email Abbe and sign up to their newsletter. Debtor Daddy provides credit control as a service, and is one of a very few companies for which you can truly say – switch on their service, and the money will start rolling in. They’re currently based in the Lightning Lab Christchurch accelerator programme. Mark this date in your diary: 5 November 2015 – Lightning Lab Christchurch Demo Day, Jack Mann Auditorium, University of Canterbury. If you’re an eligible person, that’s where you’ll get to see Debtor Daddy and nine other new companies pitch for investment. More on this below. If you’re a business owner, Debtor Daddy integrates with your cloud-based accounting system (Xero, MYOB, or Intuit), trawling through your accounts receivable (debtors), identifying who’s late in paying, and then sends a series of automated reminders to pay, and can ultimately refer recalcitrant debtors to collection agencies. They even provide an optional service to automatically have a real person phone up your debtors and encourage them to pay. This improves cash flow and also frees up a significant amount of time and mental energy by automating and outsourcing a job that nobody enjoys. Debtor Daddy claims that debtors reduce on average by 43% after 30 days of use, whilst freeing up two to eight hours per week for business owners. They’re the top ranking add-on in the Xero Marketplace debtor tracking category, and the reviews are truly stellar. One of the things I really like about this business is that it’s antifragile – turbulent economic conditions make Debtor Daddy even more valuable, and a potential anticyclical hedge investment. They already have over 800 customers, the vast majority of them outside New Zealand in 20+ other countries, and are growing mostly organically an average of 20% per month. There’s clearly a massive opportunity to greatly accelerate this growth, which is why they’re in the Lab. Cofounders Matt McFedries and Mark Haussmann have extensive startup experience and finance industry experience. This the third company Matt has founded, and Mark has been his right-hand dev straight through. They’re a tight team, and have a strong understanding that especially for this business, UX/UI is critical, both for the user and the debtors from whom they’re trying to collect. These guys are very focussed on metrics, and I had a great conversation about their Pirate Metrics, so good in fact that I asked them to present their dashboard as a case study for the rest of the Lab participants when I was in Christchurch recently giving a presentation on startup metrics. They want to get the word out about the product. They offer a 30-day free trial (no credit card info required), and after that, NZ Startup of the Week subscribers can get a further 50% discount of their first three months by using the discount code SOTW. They’re also giving away a practical free e-book on growing your business, not your debt. They’re also looking for a Rails dev, if you’re interested, apply here. And of course, they’ll be raising money on Demo Day, 5 November 2015, along with the nine other companies at Lightning Lab Christchurch. I’m hoping as many investors as possible reading this blog will come down to Christchurch that day. If you don’t have an invite yet, and you’re an eligible person or eligible investor, please contact Michelle Panzer at the Lab directly to request an invitation. Christchurch has reached an important inflection point, just in the last few months. There are now more cranes than bulldozers, more concrete mixers than dump trucks. I’ve compared the CBD to a once-beautiful tree that’s been hard pruned – it’s a shadow of its former self, but you can see the new growth sprouting up, and it’s clear that what Christchurch is becoming will be even more impressive than what it was. Rather than the backward looking “more English than England”, I’m hoping that it can become the most connected, collaborative, creative city in the world. Young people and immigrants are playing a large part in driving the agenda, and especially in the Lab, the results are stunning. So please do your bit, and come down and see the results of Lightning Lab on Demo Day. We’ll see you there.